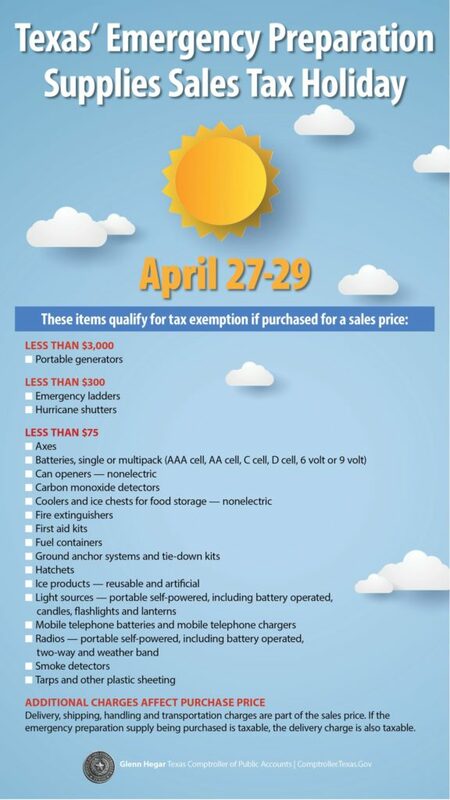 This weekend is the 2019 Emergency Preparation Supplies Sales Tax Holiday in the State of Texas. You can purchase certain emergency preparation supplies tax free beginning at 12:01 a.m. on Saturday, April 27, and ending at midnight on Monday, April 29. There is no limit on the number of qualifying items you can purchase, and you do not need to issue an exemption certificate to claim the exemption. Please visit the Texas Comptroller’s Website for more information, including a list of qualifying and excluded supplies. Hurricane Season is just around the corner. Don’t wait until the next storm is in the Gulf before preparing yourself and your family.